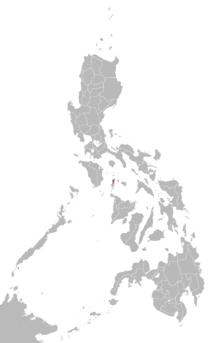 The Asi language is a regional Visayan language spoken, along with the Romblomanon and Onhan languages, in the province of Romblon, Philippines. Asi originated in the island of Banton, Romblon and spread to the neighboring islands of Sibale, Simara, and in the towns of Odiongan and Calatrava in Tablas Island. Asi speakers in Odiongan is called Odionganon, Calatravanhon in Calatrava, Sibalenhon in Concepcion, Simaranhon in Corcuera, and Bantoanon in Banton. Tablas: the municipalities of Odiongan and Calatrava, situated respectively on the western and northern parts of the island. The Odiongan dialect has more outside influences and is more widely used in literature. Banton: the island's sole municipality of Banton. Simara: the island's sole municipality of Corcuera. Maestre de Campo (also known as Sibale): the island's sole municipality of Concepcion. Linguist David Zorc notes that Asi speakers may have been the first Visayan speakers in the Romblon region. He also suggests that Asi may have a Cebuan substratum and that many of its words may have been influenced by the later influx of other languages such as Romblomanon. Asi has sixteen consonants: p, t, k, b, d, g, m, n, ng, s, h, w, l, r and y. There are four vowels: a, i/e, and u/o. The vowels i and e are allophones, with i always being used when it is the beginning and sometimes end of a syllable, and e always used when it ends a syllable.The vowels u and o are allophones, with u always being used when it is the beginning and sometimes end of a syllable, and o always used when it ends a syllable. This is one of the Philippine languages which is excluded from [ɾ]-[d] allophone. ↑ Hammarström, Harald; Forkel, Robert; Haspelmath, Martin; Bank, Sebastian, eds. (2016). "Asi". Glottolog 2.7. Jena: Max Planck Institute for the Science of Human History. ↑ , Languages of the World. ↑ Zorc, David Paul. The Bisayan Dialects of the Philippines: Subgrouping and Reconstruction. Canberra, Australia: Dept. of Linguistics, Research School of Pacific Studies, Australian National University, 1977. Lobel, Jason William. 2002. "An introduction to the languages of Romblon." In Sarokan News Magazine, July 8, 2002.